Self-serve tools that make managing payments easier for our partners. Partner Tools positions you at the helm of the ship, guiding your business decisions and supporting the success of the SaaS merchants relying on our shared expertise. The payment dashboard serves as a total-access gateway to your SaaS merchant portfolio. Fetch API keys with one click. 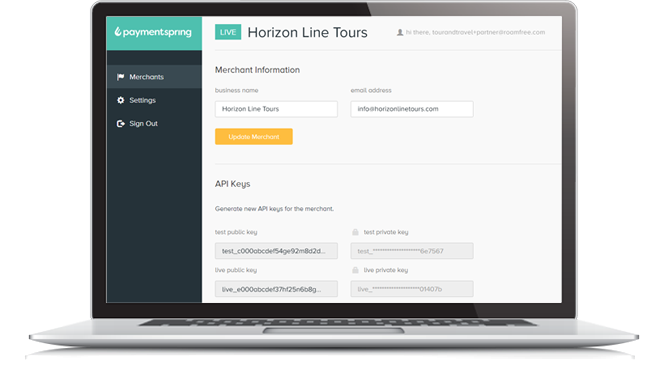 Set up merchants in minutes. Update passwords and merchant data quickly. There’s a team of developers and support staff in your corner at all times—plus, we’re completely accessible through Partner Tools. Together, we’ll learn, build and grow in ways that monetize your software platform for the long haul. We even offer campaign support to help increase your overall subscribers and convert existing users to payment processing clients. Why send customers elsewhere for payments when you can offer an integrated solution yourself? Let us show you how easy managing payments can be.